The Mirabel Resort Hotel (Pvt.) is situated amidst unique natural beauty and is 30 km. east of the capital-city Kathmandu, on the Araniko Raj Marg (Kathmandu-Kodari Highway). It's about an hour drive from Kathmandu and passes by the traditional and cultural towns of Bhaktapur and Banepa. The scenic resort is spread across four acres of land, landscaped with beautiful terrace gardens and stone paved pathways. Situated amidst hills, valleys and green forests, Dhulikhel is one of the ancient Newari towns and has preserved Newari tradition and culture. Dhulikhel, a place of exhilarating beauty and unparalleled serenity, has several Hindu temples of pagoda style. In the olden days, it was the most important gateway to Kathmandu valley from east of Nepal and Tibet. It has always been an important trade centre. 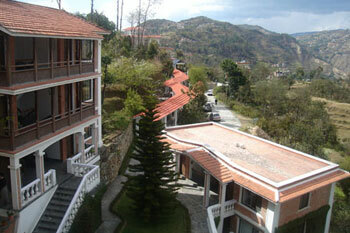 From Mirabel, many different options are available as regards to exploring Dhulikhel and its surroundings. There is also a day trip to Namo Buddha which offers both a religious pilgrimage to the Buddhist stupa as well as an easy and peaceful trek for people of all age groups.There is also a day trip to another scenic place and tourist attraction, Nagarkot. This day trek is both scenic and adventurous. Likewise, treks for a period of 3 to 7 days can be organized from this point. And, for those who want to laze and fish, there is also a day trip to the famous Sunkoshi River. This garden has beautiful pine tress and accomodates guests upto 800 people for large lunch or dinner parties. It has a 360 degree view on the surrounding hills, valleys & town of Dhulikhel.It is peaceful and offers you a feeling of being at ease. An ideal place to relax. Reflect and rejuvenate. A place to meditate and spend a weekend with your friends and family under the pine forest. An ideal stop-over before going to the newly built 1000- steps to Kalimandir, Dhulikhel hill top. 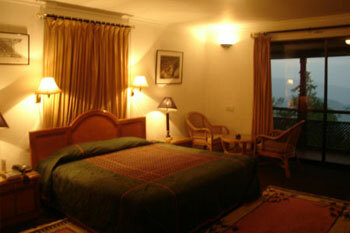 An ideal place for overnight stay before visiting the famous Buddhist shrine of Namabuddha. Of the many facilities and services offered at this resort, the three distinct dining facilities deserve some real attention. The Chharhara Restaurant on the second floor has a pleasant setting and serves Nepalese and Continental cuisines. The garden of beautiful pine tress is large enough for 800 persons and suitable for almost any kind of party. La Terrasse, a spacious beer garden on the rooftop with a 360 degree view of the beautiful landscape, can be a perfect venue for merrymaking.